If you click on parts of this BBC B motherboard, you will be shown information about what you have clicked on. The microprocessor used in the BBC Micro is a 6502A running at either 1 or 2MHz. Most processing is done at 2MHz, including accesses to the Random Access Memory (RAM) and Read Only Memory (ROM). The processor slows down to 1MHz when addressing slow devices such as the 1MHz Extension Bus, the Analogue to Digital Convertor (ADC), and the Versatile Interface Adapters (VIA). A 16MHz crystal oscillator is used to provide clock signals for the CPU in conjunction with divider circuitry in the video processor ULA (IC6) which produces 8, 4, 2 and 1 MHz signals. The 1MHz system clock is actually generated by externally dividing the 2MHz signal by 2 using a D-flipflop (half of IC34); the 1MHz signal out of the video ULA is only used for driving ICs 5 and 15. Two more D-type flipflops (IC30) and an OR gate are used to generate the 2MHz clock for the CPU, which has a specific waveform requirement. Requests for a 1MHz processor cycle from the address decoding are fed via an inverter (1/6th of IC33) to a D-flipflop (half of IC31) which latches the request for a 1MHz cycle. At the appropriate time, as governed by the 2MHz clock, one of the 2MHz clock cycles is masked off by a D-flipflop (half of IC34). When this happens the D-flipflop that latched the request is cleared, to reenable the 2MHz CPU clock at the next appropriate clock phase. 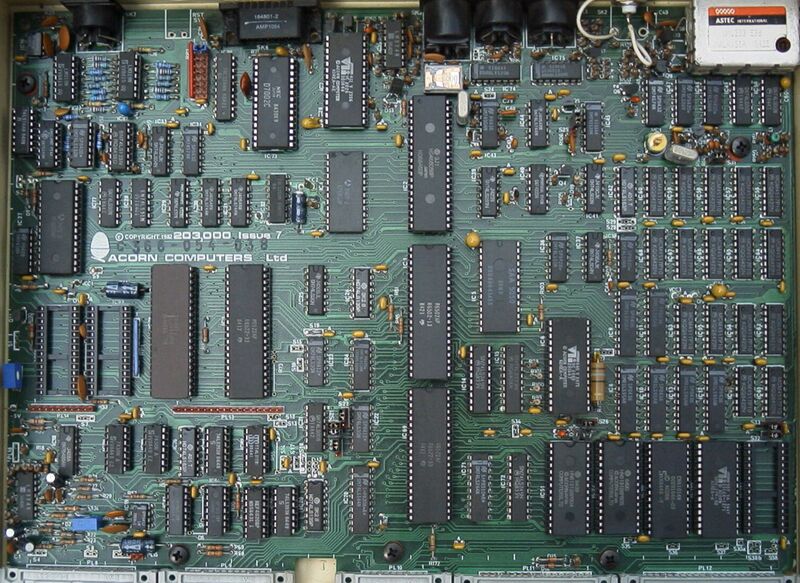 This is the heart of the BBC Micro's video circuitry. Its major function is that of displaying the video data in memory on a raster scan display device such as a television or monitor. As a bonus, the sequential nature of accessing the system RAM for the video display refreshes all the DRAM storage. The 6845 is responsible for producing the correct format on the display device, positioning the cursor, and monitoring the light pen input. Other video functions involving colour and Teletext are dealt with by the video ULA (IC6) and the Teletext Character Generator (IC5). The BBC Micro contains two VIAs. One (IC3) is dedicated to internal system operation, the other (IC69) is available for system expansion. Port A of the system VIA acts as a slow data bus which connects to the keyboard, the sound generator (IC18) and speech system chips (IC98, IC99). Port B drives an addressable latch which is used to provide read and write strobe signals for the speech interface, the keyboard and the sound generator chip. Also, coming from this latch (IC32) are control lines C0 and C1 which indicate the amount of RAM devoted to the display memory to be 16K, 8K, 10K or 20K. Outputs 6 and 7 of the addressable latch drive the caps lock and shift lock LEDs on the keyboard. Two I/O lines on Port B are used to input the two 'fire button' signals from the paddle connector SK6 and two more lines are used as response lines from the speech interface. Each time the system VIA is written to, the latch connected to port B is strobed by a flipflop (half of IC31) which is triggered from the 1MHz clock signal. Port A control line 1 (CA1) is used for detecting keyboard activity, CA2 is connected to the video vertical sync, to generate the Start of Vertical Sync event. CB1 takes the ADC End Of Conversion signal, and CB2 is used for the Light Pen Strobe signal. This device is used to buffer and serialise or deserialise the audio and RS423 data. It is used in conjunction with an Uncommited Logic Array (ULA) (IC7) specifically designed for the BBC Micro. Contained within this ULA is a programmable baud rate generator, a cassette data/clock separator and switching to select either RS423 or cassette operations. IC42 divides the main board 16MHz clock by 13 and this signal is divided further within the serial interface ULA to produce the 1200 Hz cassette signal. Automatic motor control of an audio cassette recorder is achieved by a small relay driven by a transistor from the serial interface ULA. The signal out of the cassette is buffered and the incoming signal is suitably filtered and shaped by a three stage amplifier, implemented using a LM324 quad opamp (IC35). Display mode 7 is a Teletext character mode. When using this mode, only 1K of RAM is devoted to the display memory and the characters are held within it as ASCII bytes. To implement this an SAA5050 Teletext character generator is used. IC15 latches the DRAM data going into the SAA5050, which then translates these bytes into a standard Teletext/Prestel format display. A 6MHz clock signal is required for the operation of this device. This signal is produced by knocking a reset flip flop (two quarters of IC40) backwards and forwards from 8MHz and 4MHz clock signals. The resulting flip flop output is then itself inverted according to the state of the 2MHz clock signal by an exclusive OR gate (.25 of IC38). Glitches on this output are removed by R119 and C48 to produce the 6MHz clock signal at IC37 pin 8. The video processor device (IC6) is a custom uncommitted logic array (ULA) developed especially for use in the BBC Micro. At the end of each CRTC 250nS access period, it latches the byte from the RAM and, according to the display mode in operation, serialises the byte into 1 bit stream of 8 bits or 2 bit streams of 4 bits etc. In this way, display modes varying in width from 640 pixels in 2 colours to 160 pixels in 8 colours, which may or may not be flashing, can be produced. Also, in the video processor is a high speed piece of static RAM called a palette. This memory can be programmed to define the relationship between the logical colour produced by the RAM and the physical colour which will appear on the display. Thus, in a 640 pixel mode, the two colours to appear on the display need not be black and white, they may be, say, red and blue. Note that the data in RAM is unchanged by the palette, it is the mapping onto physical colours which changes. Modes 0 through 6 in the Micro are so-called bitmapped screens, which allow for raster graphics. With these screens, each pixel on the screen corresponds directly with one, two or four bits in the video memory. This method of producing video screens is expensive in memory, involving a minimum of 8 kilobytes for the display. Six octal buffers, type 81LS95 (ICs 8-13) are used to switch control of the RAM address lines between the Microprocessor and the CRTC. Enables and buffers the RAM data lines to the system data bus. Is disabled when the RAM is accessed by the CRTC. A 555 timer circuit (IC16) provides a reset signal at power up or when the reset key is pressed. Also on the circuit board is a power up reset CR circuit from the +5 volt power supply (C10, R20 and D1). This provides a signal called Reset A which is fed to the system VIA (IC3). Whilst the 555 timer produces a general reset at power up or when the reset key is pressed, the CR signal Reset A only goes low at power up. By interrogating IC3 on the occurrence of a general reset, the system can thus detect whether this is a cold start, i.e. power up, or a hot start, i.e. the BREAK key or reset switch being pressed when the system has already been in use. IC18 is a four channel sound generator chip which may be programmed to generate sounds of varying frequency and amplitude on each channel. A quad opamp (IC17) performs mixing the sound generator and speech generator (IC98, IC99) signals and an optional auxiliary signal from the 1MHz bus, amplifies and filters the result, and feeds it to IC19. IC19 provides audio power amplification to drive a speaker (connected to PL15). All the I/O hardware is located within locations &FC00 to &FEFF. These three 256-byte address ranges (pages) are commonly referred to as FRED, JIM and SHEILA. FRED and JIM are concerned with external user hardware connected to the 1MHz bus and can optionally be disabled; SHEILA contains all of the system's internal hardware device registers. This is decoded by IC22 and via ICs 20 and 25, the OS ROM (IC51) is then masked off over this range of addresses. ICs 24 and 26 decode the individual devices in this range; IC23 detects when a slow 1MHz device is being addressed, initiating the system clock circuitry to do a slow clock cycle. Used in conjunction with IC36 and the signals C0 and C1 out of IC32 to map the CRTC address lines to the correct DRAM starting address. In order for the receiving television to interpret the colour information, a reference colour burst has to be provided at the beginning of each line. A short burst gate signal immediately after the horizontal sync pulse for each line is produced at IC41 pin 4, and is timed by C45 and R109. This burst gate allows through a standard colour subcarrier signal which the television uses as its colour phase reference for that line. The PAL colour signal may be added to the composite video output by closing link LK39. Diodes D20, 21 and 22 adjust the luminance for the three separate colour signals to create a composite signal with better readability of dark colours when displayed on a domestic television set. ICs 44 and 45 are the core of the DRAM address multiplexing circuitry. The multiplexing Row Address Strobe (RAS) signal is produced by a D-flipflop (half of IC44) connected to the 8 and 4MHz clock signals. This RAS signal then drives all of the dynamic RAMs via R106. Column Address Strobe (CAS) signals are generated by one half of IC45. In Model A computers having only one bank (8 devices) of RAM only CAS 1 is used. Model B systems with 32kB of RAM have the second bank of RAMs selected by a 74LS51 (IC28) which controls the decoder/latch (half of IC45) generating the CAS signals. The other half of IC45 is used to select between the processor and CRT address lines. The actual switching of the address lines is done by enabling the appropriate 81LS95 buffers IC8-IC13. 32 kilobytes of Read Only Memory are catered for in the Micro address map. The upper 16 kB (&C000-&FFFF) of this are occupied by the operating system ROM (IC51), with three pages of 256 bytes each not used by the system ROM but mapped for use by I/O devices instead (see IC24). Apart from the OS ROM, four other Read Only Memories (ICs 52, 88, 100 and 101) can be on the main circuit board. In the Model A, four 4kB ROMs may be in these four sockets in order to fill the 16kB address space (&8000-&BFFF). In this case, a 2-to-4 line decoder (half of IC20) is used to select which of the four devices is being selected by the address lines A12 and A13. 8kB or 16kB ROM devices can be accomodated with appropriate link settings (links 20, 22, 30 and 32-38), but the maximum usable ROM size can only be 16kB. In the Model B, significantly more flexibility is offered, with a ROM Select Latch (IC76) being used to 'bank switch' one of up to four ROMs into this address range. This allows for different programming languages, system software extensions such as a Disc Filing System, or application software like a word processor to be installed, and be activated when needed. Normally, IC52 will contain the resident BASIC interpreter, with ICs 88, 100 and 101 available for additional ROMs. If these ROMs all stand by themselves, switching is by straightforward use of IC76 in conjunction with IC20 to control each of the ROM's Chip Select lines. Applications or extensions with a size of 16kB, but fitted in a pair of 8kB ROM devices can be accomodated by driving IC20 off address line A13 together with just one output of the ROM Select Latch (IC76). Overall address decoding for the ROMs is by IC21 which decodes memory addresses &8000-&BFFF and &C000-&FFFF. Locations &0000-&7FFF (&0000-&3FFF for the Model A) are assigned to the system DRAM. This is decoded by feeding A15 into IC21 pin 4. Note that in early versions of the BBC Micro, the operating system may be contained within 4 EPROM's in IC positions 52, 88, 100 and 101 with the BASIC interpreter being located in IC51. As the OS ROM still needs to occupy the range &C000-&FFFF, the address ranges which are assigned to IC51 and ICs 52, 88, 100 and 101 are swapped using the two links comprising S21. This arrangement is abnormal and it was phased out. Users wishing to expand their systems support ROMs will have to have their original operating system EPROM's exchanged for an operating system ROM which should then be put in the usual position, with the two S21 link wires changed from North-South to East-West. Random Access Memory on the Micro is provided by either 8 or 16 dynamic memory devices (DRAM) (ICs 53-68). In order to reduce the external pin count and simplify the internal architecture of DRAM devices, their address inputs are usually multiplexed. The 16kbit devices used in the BBC Micro require 14 address lines, but by virtue of this multiplexing only 7 pins are required. Addressing is achieved by first offering the lower 7 bits of the address which are then latched by the DRAM on a Row Address Strobe (RAS) signal, after which the high 7 bits of the address are set up and latched by a Column Address Strobe (CAS) signal. At this point the required address is complete, and data can be read or written. This sounds like a time-consuming process, but by running the address multiplexing at twice the speed of the system clock the DRAM data stays in step with the rest of the system. In the Micro, the RAS and CAS signals are derived from the 8, 4 and 2 MHz clock signals by ICs 44 and 45. Two devices may have control of the RAM address lines: the 6502 CPU (IC1) and the 6845 CRTC (IC2). The CRTC generates the raster scan signals for the video display, together with the address for each memory mapped byte of information in the RAMs which is required to refresh the display. DRAM ICs 61-68, and expansion ICs 69-77 are required for the BBC Model A to be upgraded to a Model B.
IC69 is the second versatile interface adaptor present in the BBC Micro. Port A is used to provide a centronics standard parallel printer interface, with the octal buffer IC70 being used to buffer the data lines. Port B is left uncommitted and is free for use by the user for input or output purposes. This device provides a four channel ADC facility with 10-bit resolution. It connects straight to the Micro's data bus and is a dual slope convertor with its voltage reference being provided by the three diodes D6, D7 and D8. The RS423 Transmit and Receive data signals and the Request-To-Send and Clear-To-Send flow control signals are interfaced by ICs 74 and 75 which translate between TTL and standard RS423/232 signal levels. Note that this is one of the few sections of circuitry on the Micro which requires an additional -5v supply to be present. IC78 is a floppy disc drive controller circuit which is used to interface to one or two single or double sided 5.25 or 8 inch floppy disc drives. Logic signals from the controller to the disc drive are buffered by two open collector drivers IC79 and 80. The incoming signal from the disc drive is first conditioned by the MMV IC87 producing a pulse train with each pulse of fixed width. These pulses are then fed to the data separation circuits ICs 81 and 82. This is a digital monostable. IC86 divides the 8MHz clock signal down to 31.25kHz. ICs 83, 84 and 85 are then used to detect index pulses coming in from the drive which show that the drive is ready for a read or write operation. Empty ROM socket, occupied by a DFS ROM when DFS expansion fitted. ICs 89 to 96 are concerned with the Econet interface. IC89 is an Advanced Data Link Controller Circuit, type 68B54 which handles the synchronous high-speed serial data transmission that is the basis of the Econet protocol. Data to be transmitted on to the network is fed from the ADLC to the line driver circuit, IC93, which is enabled from the RTS line on IC89. Transmit data then goes through the line driver circuit which produces a differential signal drive to the Econet cables. Received data is detected and converted to a logic signal by one half of IC94 which is a dual comparator circuit type LM319. The received data is then fed back to the data link controller circuit. An Econet installation has a single master clock station which provides the clock for the whole of the network. This clock signal is transmitted around the network as a second differential line signal and is used to clock the data in and out of the data link controller circuits. The network clock is also detected using one half of a LM319 comparator circuit, and the detector clock is then fed to both receive clock and transmit clock inputs on the 68B54. In the presence of a network clock, the monostable circuit, IC87, is permanently triggered and this provides a data carrier detect signal for the data link controller chip. Once the network clock is removed, the monostable immediately drops out and the data carrier is no longer detected. The Econet is a broadcast network system on which a number of stations may attempt to transmit their data over the network at any given time. In this setup, a situation called a collision can occur when two or more stations transmit at the same time. The transmitting stations should detect the collision and back off before attempting to repeat the transmission. Collision arbitration software is included in the Econet system. Collisions on the network data lines result in the differential signal on the two data wires being reduced. This condition is detected by IC95 which is another dual comparator circuit. When there is a good differential data signal on the network one output of IC95 or the other will be low, in which case the output of IC91 pin 6 will be high, indicating no collision. When there are no collisions on the network, and the network clock is detected by the clock monostable, the data link controller is clear to send data over the network. When there is a collision on the network both outputs of IC95 will go high and the clear to send condition will cease. Note that when the computer is not connected to the network, a collision-like situation results, in which case again the data link controller will not get a clear to send condition. Each Econet system requires termination at the two extreme ends of the network. Installing these optional termination components (R26, R42, R53, R54, R56, C19, C22 and D3) was catered for on early releases of the Micro printed circuit board, but this was abandoned in favour of the more flexible method of using terminating network connection boxes. Similarly, there was also provision on the board for a network clock source. The 6MHz signal is divided by two to produce 3MHz and this drives IC90 which is a counter with decoded outputs. One decoded output of the counter is selected to define the network clock frequency and the counter then counts until this output goes high at which time the counter resets and starts again. The selection of this clock signal depends on the length of the network with the longer networks requiring a slower clock. Further selection divides the given frequency by two or by four producing network clocks in the range 75 to 625kHz. The other section of IC93 is then used to drive the differential clock around the network, assuming that the computer is enabled to be a clock source by select link 5. Up to 253 (the numbers 0 and 255 being reserved, and the use of number 1 discouraged) stations may be connected to each Econet with each station being identified by a unique station identification number. This station ID is programmed using S11, which can be read by enabling the octal buffer IC96. The data link controller circuit generates interrupts which are fed to the central processor NMI line. These interrupts are enabled and disabled through the INTON and INTOFF/STATID signals out of IC26, which are controlled from the Econet interrupt service routine. The speech system device used is a TMS 5220 (IC99) which, on instructions from the Micro, will either produce at its audio output 'canned' speech from its associated memory (IC98) or speech data can be fed to it directly from the Micro's memory. The audio output of the speech system is filtered such that it has a cutoff frequency of 7kHz, after which it is mixed with the signals from IC18 and the 1MHz bus. Empty ROM socket, occupied by NET ROM when Econet expansion fitted. The address and data lines, A0-A7 and D0-D7, together with some page select and control lines are available as the 1MHz extension bus to which various peripheral devices may be connected, e.g. a Teletext interface. All accesses to this bus will be at 1MHz processor speed. The octal buffer IC71 and the octal transceiver IC72, are used to interface these signals to the internal data and address buses. There is also a provision for an audio signal from the peripheral to be mixed with the Micro's internal audio signals. The red, green and blue logic signals produced by the video processor are buffered by transistors Q4, 5 and 6 and fed out together with a composite sync signal to the RGB connector (SK3). This output is suitable for feeding straight to the gun drives of RGB monitors. The red, green and blue lines are summed together by binary weighted resistors to feed Q7 which produces a 1V composite video signal suitable for feeding to a monochrome monitor, on which the different colours will appear as different intensities. By closing LK39 the chroma signal present at Q9 will be added to this signal, enabling colour display on suitable monitors. The keyboard circuit connects via PL13. A 1MHz clock signal is fed to a 74LS163 binary counter, the outputs of which are decoded by a 7445 decoder driver circuit. These outputs drive along one row of the keyboard matrix and each row is driven in turn. If any key is depressed the 74LS30 gate will produce an output when that row is strobed and this will interrupt the computer on line CA2 of IC3. On this interrupt, the computer will enter the key reading software. In order to discover which key was pressed, the microprocessor loads directly into the 74LS163 the address of each key matrix row allowing it to interrogate each row in turn. Also, the microprocessor loads into a 74LS251 data selector, the address of each specific key on that row, i.e. column addresses. In this way, the microprocessor can interrogate each individual key in turn until it discovers which one was depressed and causing the interrupt. Once read, the keyboard regains its free running mode. The power supply unit produces 5 volts at around 2 amps and -5 volts at around 50 milliamps for use on the main circuit board. Some auxiliary power for accessories may also be available on an external connector. The power supply connects to the main circuit board by seven .110 fast on tabs with the +5 volts being fed to three different points across the main circuit board. These points are all connected together electrically. However, by distributing the power in this way the need for very large copper tracks to distribute power around the board is avoided. Most computers in production will have a switch mode power supply, the circuit diagram for which is given. It is not recommended that attempts should be made to repair this power supply, instead it should be treated as a module to be exchanged. A small number of early computers may have a linear power supply unit with a conventional mains transformer and regulator circuit. These also should be treated as modules to be exchanged rather than serviced.